I found I could not resist a delightful print from The Drapery. I saw it when I went there to buy denim for the jeans making project and I did resist it twice (as I really do not need more fabric) before investing. The Drapery don’t give me anything, by the way–I am just keen to support such a lovely, local, independent business when I can. I decided I would make the Esme top from Everyday Style by Lotta Jansdotter. First tracing off the pattern, then cutting out… and finally, after a long wait, the sewing. I love the watercolour look of those big dots! And I have no idea how I selected these points in making it up to photograph. It is a delightfully simple and quick top to make compared to my classic long sleeved, buttoned down the front shirt with collar stand, collar, cuffs, buttonholes, plackets and all. Which is also to say it is a departure from a lot of other garments in my wardrobe. Some time back I bought the pattern for the Jac Shirt (Tessuti Fabrics). Finally, the time came to make it. I chose size XL. Let it be said that what follows is no critique of the pattern but only of my own ways. I was defeated by the difference between myself and the listed measurements. I just went for the biggest size and, well, how bad could it be? I can always make the next size smaller if it turns out this was not the right call. I made some adjustments. And really, I should have known while I did this… that once again I was picturing myself as even bigger than I am, in real life. How many garments have I made way too large? (Ahem, for those new to the blog… a considerable number). 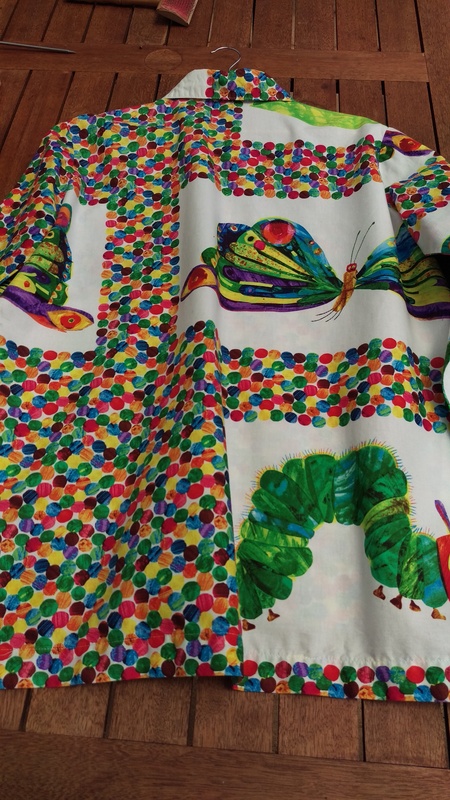 I cut the pattern out, and sacrificed one of my tablecloths for the interfacing. In an absolute first, embroidered interfacing. The tablecloth must have been gorgeous for many years of its life but it is now threadbare and stained, the embroidery coming away. 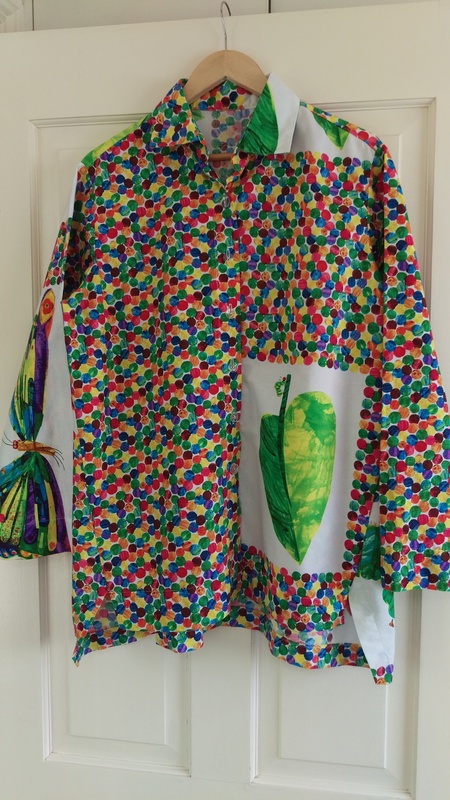 I spent some time figuring out how to feature the large designs on the print and how to use the all-over printed matching fabric I had bought some years ago. The pattern has very good instructions. I descended into mystery in a couple of places where mitred corners were so different to the shirt constructions I am accustomed to that apparently I could not accept the evidence of the pattern at some deep level. 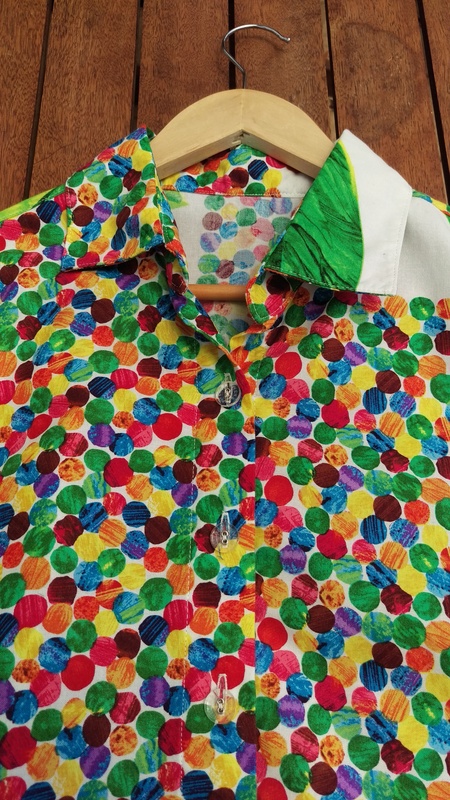 And finally, I have a very lovely shirt with some recycled buttons. It is… oversized. I think no adjustment was necessary, apart from to my own personal beliefs! I will try to remember that next time and plan to make this pattern again, in a different size. Maybe one of the sizes on the envelope?